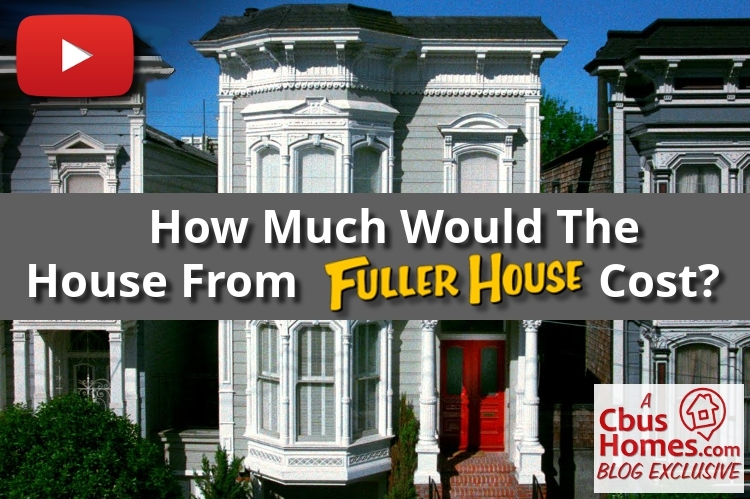 WATCH VIDEO: How Much Would The House From Full House and Fuller House Cost? Disclaimer: I am not a licensed real estate agent in California, so all of my estimates are for entertainment purposes only. First, Where Is the Full House / Fuller House Located? The original “Full House” series, along with it’s newly remade and released “Fuller House” on Netflix, centers around Danny Tanner’s (Bob Saget) home in San Francisco, CA. But since this is the world of entertainment, we need to ask, “Is this a real house?” Or is it completely a house built on some studio lot in Hollywood? It turns out, the house exterior that we see in the opening credits and the scene transitions is a real house in San Francisco, CA. There has been much debate over the exact address of the home, but according to fan site Full House Forever (www.full-house.org), the actual house used for the exterior shots is 1709 Broderick Street, San Francisco, CA 94115 (though on the actual show, they reference their home address as 1882 Girard Street). Next, What Features Does The House Possess? When determining a home’s value, it’s necessary to know what features the house possesses. Plus, outside of the basics, like bedrooms, baths, square footage, garage, lot size, etc., are there any bonus features (i.e. finished basement, pool, recent updates) or any red flags that may keep buyers away (i.e. power lines, railroad tracks, high crime rates, poor schools, etc.)? According to a quick search, Trulia lists the house at 1709 Broderick Street as being 3 bedrooms, 3 full bathrooms, 2,484 square feet, with a total of 11 rooms. From photos, it appears it also has a 1-car garage. Here’s where it gets tricky. While the house at 1709 Broderick Street is the actual house, that’s only partially true. The outside of 1709 Broderick is the outside of the “Full House” / “Fuller House” house. But the inside is a staged set. So the real inside of 1709 Broderick Street doesn’t look like what we see on TV. But for our purpose here, let’s just conveniently skip right past that and ignore that fact. If you’re curious about the inside, here’s a video tour of the real 1709 Broderick Street. What Are Similar Houses In That Area Worth? To determine the price of a house here in the Columbus, Ohio area, where I serve as a Realtor, I try to find the most comparable homes to my subject property, identify what those comparable properties are selling for by looking at the most recent comparable sales, weigh the features against the subject property and BANG! That’s how we can determine values. So, that’s what I’ll try to do for San Fran – all the way on the other side of the U.S. Looking at Trulia, Zillow, and Redfin, and taking into consideration all of the listed comparable recent sales and home values, we see a range of comparable values from $2.1 Million up to $3.6 Million. Obviously, those comparable sales have similar features, some with extra bonus features, raising values… some with red flag features that bring those values down. When did the subject property last sell? And how much did it sell for? How much do sites like Zillow, Trulia, and Redfin estimate the subject property’s value? So, 1709 Broderick Street, San Francisco, CA 94115 last sold in April 2006 for $1.85 Million. Now, 2006 was near the height of the market, before the financial crisis caused home values to plummet. However, since that time, home values have rebounded with the market and are now worth more than they were back then. Next, what do Zillow, Trulia, and Redfin (the three sites we’re using in this experiment) say about the estimated value? Finally, How Much Is The “Full House” / “Fuller House” House Worth? Taking into consideration all of the above research and information, coupled with the fact that there is likely a slight bump in value due to the home holding a bit of a bonus, being a “famous” house, and therefore in slightly higher demand, my best guess is that the “Full House” / “Fuller House” House is worth………………. *Disclaimer: I am not a licensed real estate agent in California, so all of my estimates are for entertainment purposes only. Well, what do you think? If you had the funds, would you pay over $3 Million for that house? You did the research with me. Were you thinking about the same price? I’d love to hear from you. Plus, especially if you’re a Realtor from San Francisco who stumbles across this page, I’d love to know your opinion if I’m in the right ballpark or not.